Successfully Added HK Warehouse Blackview R6 Smartphone - 5.5 Inch FHD Display, Quad Core CPU, 3GB RAM, Android 6.0, 4G Dual SIM (Gold) to your Shopping Cart. 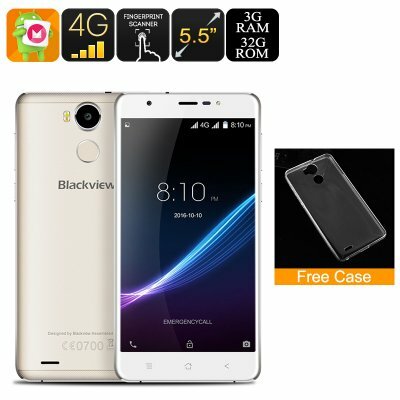 Blackview has released the R6 Smartphone and in terms of specs you get a lot for the affordable price of around $120. The Blackview R6 phone features a 5.5 inch full HD display with 2.5D glass. this has a very narrow bezel and with the metal frame makes for an impressive appearance. On the rear of the phone is a 13MP camera that alongside the dual LED flash brings good quality photos even in low light conditions. Just beneath the camera you have a fingerprint scanner that is very responsive and offers secure access to your phone in a fraction of a second. Beneath its large screen this phone contains a capable quad-core MTK processor clocked at 1.5GHz, and with 3GB of RAM it will deliver a seamless fast performance. This setup is more than capable of running games, playing movies, surfing the web and more. With the Android 6.0 OS you have an easy to use interface that brings great features such as Now on Tap, there are also plenty games and apps to choose from in the Play store as well as plenty of ways to customize your phone experience. Supporting dual SIM with dual standby 4G connectivity you can keep 2 numbers active at one time, this lets you efficiently manage businesses personal contacts with total ease as well as making it easy to avoid roaming charges when away from home. All our products come with 12 months warranty, brought to you by the leader in electronic devices as well as wholesale gadgets..